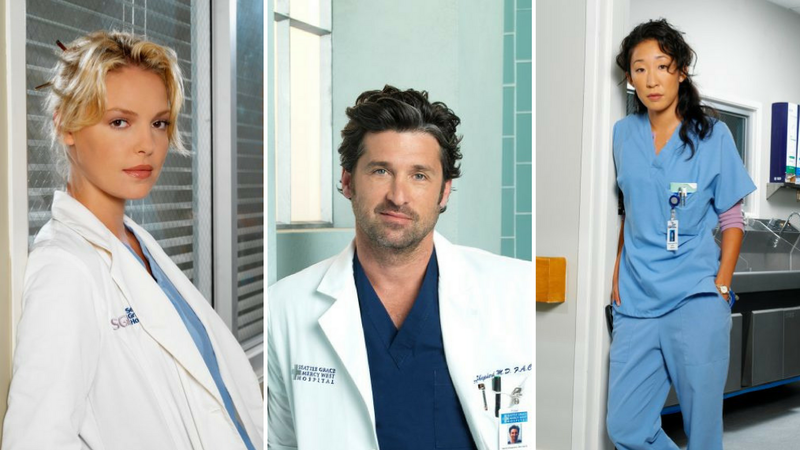 Stalwart ABC show Grey’s Anatomy is constantly reinventing itself and shuffling its cast, but it never forgets its history. In fact, with so many fans who have watched Grey’s since Season 1 and so many others who’ve caught up with the drama through Netflix, the show capitalizes on its callbacks. The show’s 300th episode was loaded with nostalgia, but really, the entire 14th season was suffused with references to characters and plotlines of seasons past. The actresses appeared on the show for nearly 10 years each. When Kim Raver left Grey’s Anatomy at the end of Season 8, Shonda Rhimes said the actress was ready to give Dr. Teddy Altman a “much-needed vacation.” That vacation ended this season, with Teddy returning for a lot more drama with unrequited love Owen. Now he’s apparently Teddy’s baby daddy, too, and Raver is coming back full-time for Season 15! Paramedic Matthew Taylor went from April’s jilted groom from Season 10 to her one true pairing in Season 14. Sure, it was awkward for her when he came back to the hospital — and heartbreaking when his wife died of postnatal complications — but it was sweet when we viewers realized he and April had rekindled their romance and even sweeter when he proposed and married April on the spot in the Season 14 finale, sending her off toward a happily-ever-after. One last note about April: After she survived her and Matthew’s car crash, she thanked Owen for rescuing her from the ravine by saying, “You always come and bring me back.” In case you missed that bit of nostalgia, that line was a nod to Season 9, when Owen traveled to April’s family farm in Ohio to persuade her to return to the hospital. In the Season 14 finale, fans will say two more goodbyes to Arizona and April. As for other happily-ever-afters, we can assume Callie Torres and Arizona Robbins — that’s “Calzona” to shippers — finally reunited for good in New York City after Arizona chose to move to there with their daughter Sofia and after Callie texted her to say she was single and excited to see her! We didn’t get to see Sara Ramirez reprise her part as Callie, tragically, but we at least heard her. Her cover of the Brandi Carlile song “The Story” underscored the final moments of Season 14 — and, not coincidentally, the final Arizona scenes — harkening back to when Sara belted out the song in Season 7’s musical episode. Not only did Arizona get a romantic reunion, she scored a professional one, too. Nicole Herman — played by Oscar winner Geena Davis, last seen in Season 11 — returned to the hospital with a job offer for her former mentee. Now the two surgeons are founding the Robbins-Herman Center for Women’s Health (so named because the name Herman-Robbins “sounds like we’re a dude,” as Nicole said). Did you know that, according to a scientific study, showed that if you stand in a superhero pose for just five minutes before a job interview or a big presentation or a hard task, you will not only feel more confident, you will perform measurably better? You would know that if you had watched Amelia extol the stance’s virtues back in Season 11! And it’s only fitting she would ask her medical team to stand like superheros before they excised her brain tumor in Season 14. Ellen Pompeo and the producers are already contemplating the grand finale. And speaking of the early days of Grey’s, Sarah Utterback reprised her role of Olivia Jankovic (née Olivia Harper, one of the hospital’s former nurses) for the first time since Season 6. Yep, Utterback was back, and yep, Olivia gave Alex plenty of guff for giving her syphilis in Season 1! Walter, Meredith’s former psychiatrist, had perfect timing when he came back for the first time since Season 12… or perhaps his blood clot had the perfect timing. In any case, Walter happened to check in as a patient at the hospital just as Mer needed someone to help her sort out her Nathan Riggs feelings.